It has been a couple of weeks since the accident where Mia slammed her finger in a door and she is healing nicely. So I figured it was about time to add a post about the incident. I don't think I will go through all the gory details, just enough to give you the big picture.It all happened the night before we were leaving for a vacation to a water park. Mia was in the house running to keep up with her big sister who just went out the back door. Some how Mia caught her finger in the door. Ouch! After cleaning it off, we made the pretty obvious decision that a doctor needed to see it. Mia and I hop in the avalanche and head off to MO Baptist Pediatric ER. While Mia was screaming in pain, once in the car she started to calm down. She did say she wanted her Ga, a.k.a. grandmother and when I called and gave Mia the phone, that just made her cry more. At the hospital Mia was amazing! She was very calm and let the doctors do their thing. It did take quite a while to get everything ready (x-rays, local anesthesia, a couple of opinions, etc.) but Mia was a trooper through the whole four hours. The end result was a broken finger tip and the finger nail had come out of the nail bed. However, the repair work went well and after a couple months of a cool, black finger, Mia should be back to normal. Of course the doctors told us to keep the finger dry. However, that did not keep us from going on and enjoying our trip to Great Wolf Lodge. Vinyl gloves and some elastic wrap worked wonders! When we returned for follow up visits, Mia was again pretty good. The first visit she was a little nervous about the nurse taking off her bandage, but not as bad as Jennifer. But Mia learned to keep her finger safe and kept up her active lifestyle. We had our second follow up visit and all is going well. 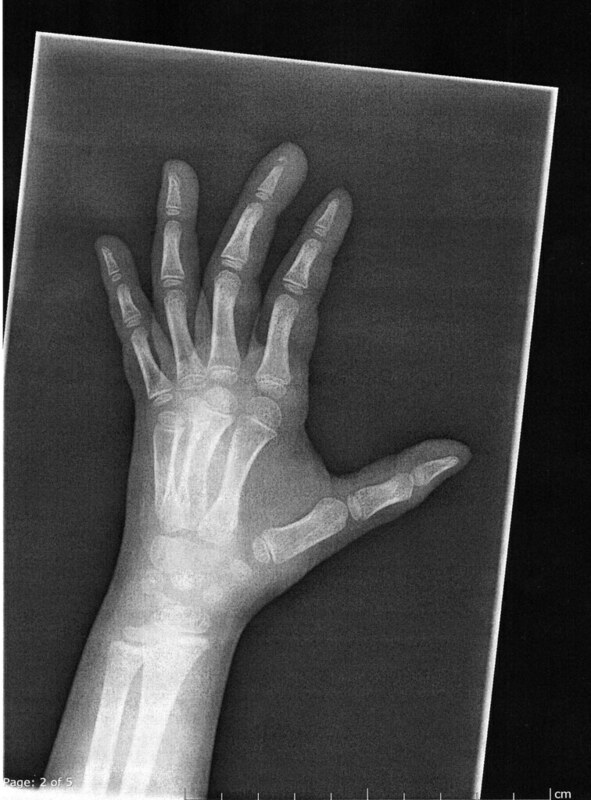 You can see the very tip of her middle finger is broken in the image of the x-ray (Now a days they show you a print of the x-ray, and you get to take them home. If you click on the image, you can see the very tip of the finger is broken. Now Mia is doing great. She only has a small bandage on her finger keeping the finger nail clean and a little protected. 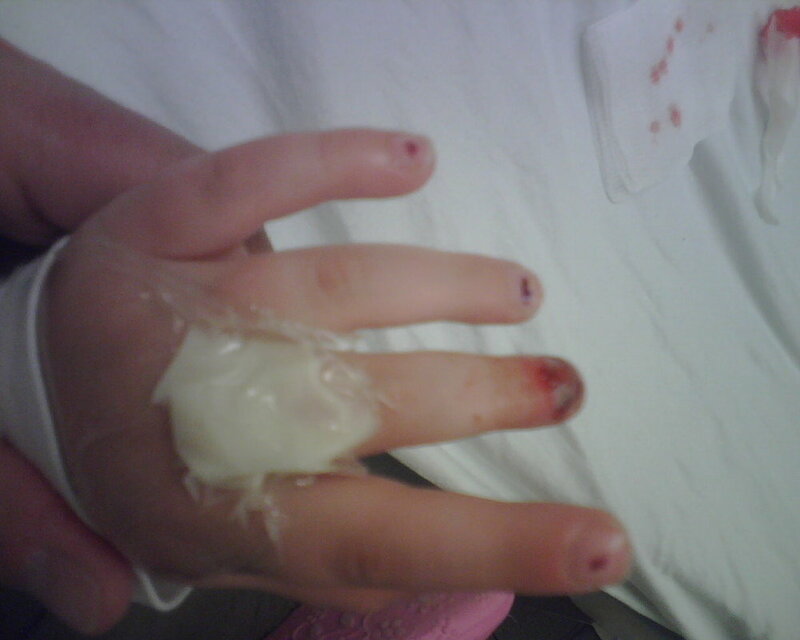 When the doctor took the splint off, at first Mia refused to bend her finger. So we had an OT come down and talk to Mia about the importance of bending her finger and gave me some OT games to play with Mia. Of course by that evening Mia was bending her finger just fine and even wanted to show the doctor how well she was doing.